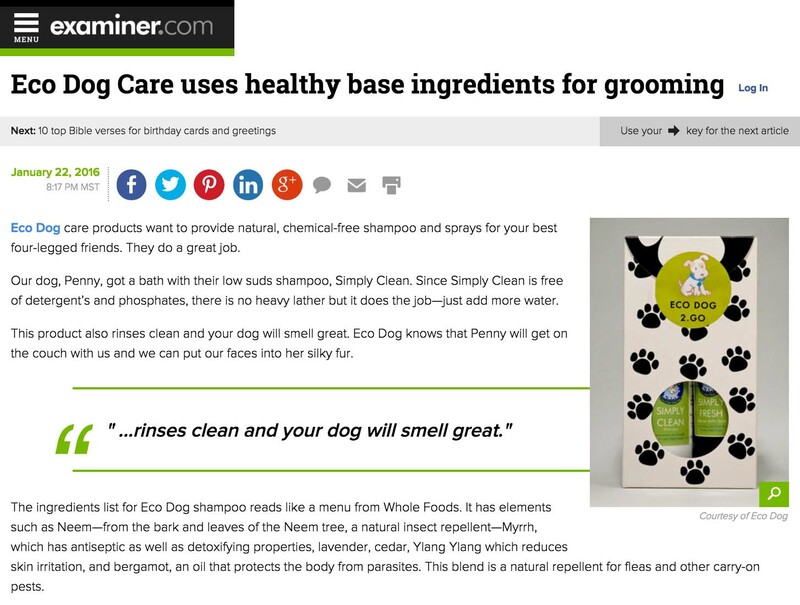 Congratulations to our ClientÂ Eco Dog Care for their feature on Examiner.com! Being “green” doesn’t mean compromise – our pups get dirty playing, running and hiking with us. They’ve got to get really clean and smell great. After all, they live with us — on our couches, in our cars and on our beds (even when we’re not looking). Eco Dog CareÂ shampoos and other care products are eco-friendly — all-natural ingredients that work well without phosphates, parabens or other toxins on your pup, your hands or in the water supply. AndÂ theirÂ sophisticated scent is crisp and fresh – you’ll want to bury your nose in your pup’sÂ fur. But eco-friendly is just the beginning of what makes their products special. They’veÂ infused their healthy base ingredients with a unique blend of eco-smart essential oils and botanicals. TheirÂ grooming products tap into the power of Nature to cleanse, soothe, heal and protect with ancient ingredients like Neem, Myrrh, Lavender, Cedar, Ylang-Ylang and Bergamot. TheirÂ natural blend can also repel fleas and other pests – stopping their hop on your dog (and you!) before they can bite! Eco Dog care does good things for your dog and the environmentÂ andÂ they also support donation and adoption events, a double plus. Find out more atÂ eco-dog-care.myshopify.com.